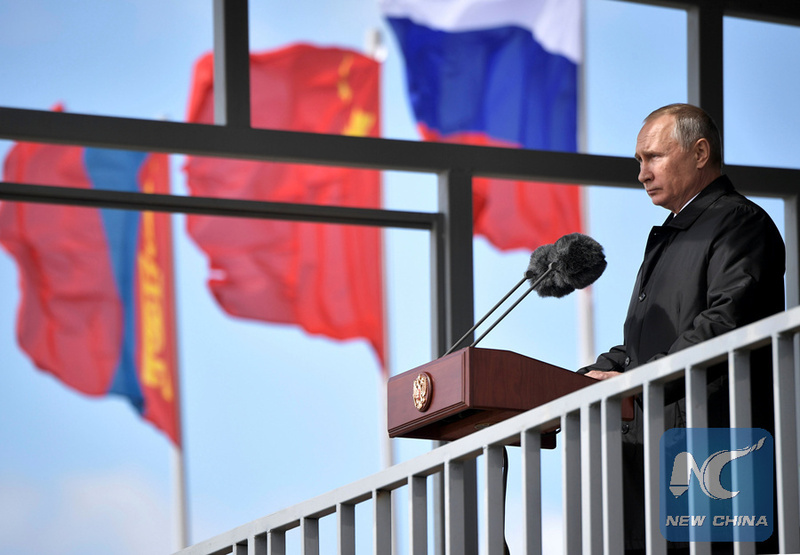 MOSCOW, Sept. 13 (Xinhua) -- The Russian Armed Forces have shown their readiness to successfully withstand potential military threats, Russian President Vladimir Putin said Thursday, after observing a series of drills involving hundreds of thousands of troops. Putin, the supreme commander-in-chief of the Russian Armed Forces, observed part of the Vostok-2018, or East-2018, drills held in the eastern part of Russia, a Kremlin statement said. The main objectives of the drills are to check the level of readiness of the military command bodies for planning and conducting the regrouping of troops over long distances and organizing interaction between land troops and naval forces, the statement said. They should also help commanders and staff improve their command and control skills, it said. The drills held on Sept. 11-15 involved nearly 300,000 troops, about 36,000 military vehicles, and more than 1,000 aircraft from Russia's Eastern and Central military districts, as well as its Northern Fleet. Units of the Chinese People's Liberation Army and Mongolian Armed Forces also participated in the drills. 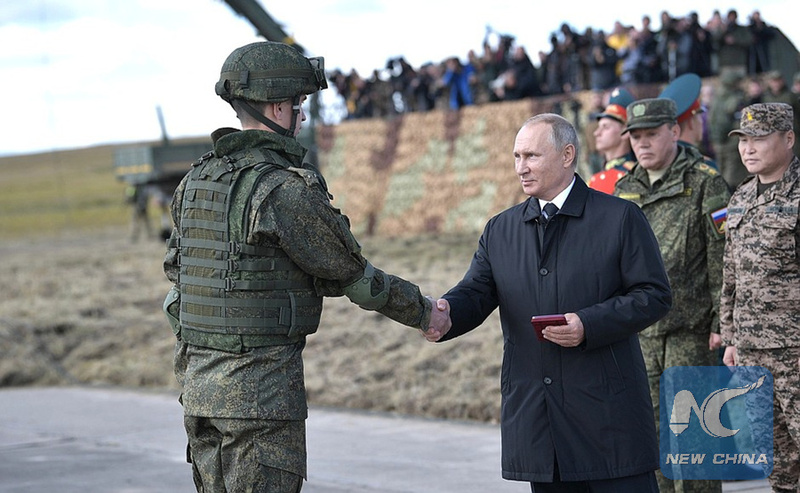 Russian President Vladimir Putin awards medals to servicemen on September 13, 2018 during the Vostok-2018 (East-2018) drills at Tsugol military training ground in Zabaikalsky region, Russia. At the end of the exercises, Putin awarded medals to 10 servicemen of Russia, China and Mongolia, who distinguished themselves during the course. Russian Defense Minister Sergei Shoigu, Russian Chief of General Staff Valery Gerasimov, Chinese Defense Minister Wei Fenghe and Deputy Chief of the Joint Staff Department of China's Central Military Commission Shao Yuanming, as well as Hansalem. 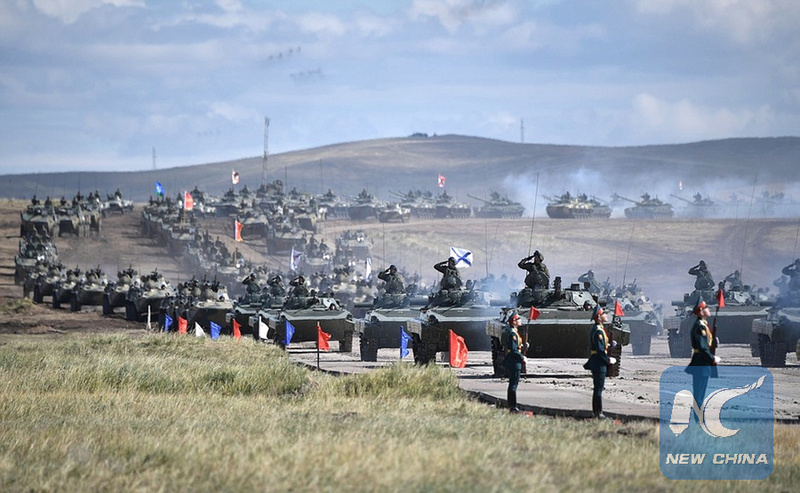 Lhagvasuren, a brigade commander of the Armed Forces of Mongolia, as well as 87 observers from 59 countries, attended the drills, according to the Kremlin.